Before you go on reading this, do something for me… Sit or stand as you normally would, and fold your arms as you normally would… Then, fold your arms the opposite way, with the opposite arm on top of the other. Chances are, that felt really weird and quite uncomfortable. Some of you probably even struggled to figure out how to do it the opposite way. That is a simple demonstration of the power of habit. We all have habits. We create habits to make life and decisions easier. We tie our shoes a certain way. We have a morning routine that is the same almost every day. Most people even brush their teeth a particular way. We program our life and put it on autopilot in so many ways so that we aren’t so overwhelmed by every little decision and task, but sometimes we program reactions without our own rational consent. Phrases like, “I just can’t help it” or “it’s automatic” or “I just lost it” are a good indication that a habit has formed. Yelling is not simply a product of anger. Anger can certainly contribute as a major trigger of yelling, but yelling is a habitual reaction to anger rather than a product of the anger itself. I can guarantee that even parents that do not yell at their children also feel anger, they simply have found other ways to respond to the anger to resolve the anger and the source of their frustration. Any habit has 3 basic parts; trigger (Antecedent), Behavior and reward (Consequence). These are the ABC’s of habit formation and habit correction. The cool thing about human Moms and Dads is that we have this great reasoning capability that other animals don’t have. This gives us the ability to choose what we will do or how we will respond to triggers in our environment. That doesn’t mean that we don’t have the same primal reactions to stress and threatening situations, it simply means that we can inhibit our instinctual reactions for long enough to select a better course of action. It may not feel that way sometimes, but it is true. The question is how do we train ourselves to change something that is so automatic? 1. Week 1: Make a check in a pocket journal anytime you get the urge to yell. Carry a little notebook and pencil or pen that will fit in your pocket everywhere you go. Don’t put it in a purse or bag. Wear it somewhere on your body so you will not forget about it. Any time you start to feel the urge to yell, make a tally mark. Just focus on recognizing when the trigger/urge arises. If you have time, you could write down what it was that triggered the urge to yell, but if not, a tally will suffice. At first this will be difficult for many. If you find yourself having a hard time recognizing the urge to yell before it happens at first, try to recognize it as soon as possible. If you start to yell, make a tally and think of what triggered it. Make an honest record. The objective is not perfection, just recognition and incremental improvement. By doing this, you will get better at recognizing your triggers earlier over time. Awareness is the first key to any positive change. 2. Week 2: Identify and implement a positive alternative and implement it. Before you start your second week, take 15-20 minutes to evaluate what the triggers of yelling were the previous week and what a positive alternative behavior would be to replace the yelling. Write your alternative response down in your pocket notebook. Your responses could include, singing, taking ten deep breathes, reciting a poem or verse of scripture, or designating a positive, calm sentence to recite to your child when the urge arises. Continue to use your pocket notebook to mark your urges and following your marking, use your alternative response instead of yelling. 3. Week 3: Write the benefits of not yelling in your pocket journal. During the next seven days start to recognize and write down the benefits you see when you stop yelling. You could note the differences you see in your child or the way you feel. If you need to continue marking your urges for more practice, feel free to do so. Make sure you continue to apply your positive alternatives to yelling. If you cannot always write down the benefits you see during the day, take a few minutes each night before bed to write them down. The procedure above can be a powerful tool in correcting our programming, but does not necessarily alter our attitudes and perspectives that greatly influence how we see our child and our role as a parent. These can have an enormous impact on the longevity of our new habits. 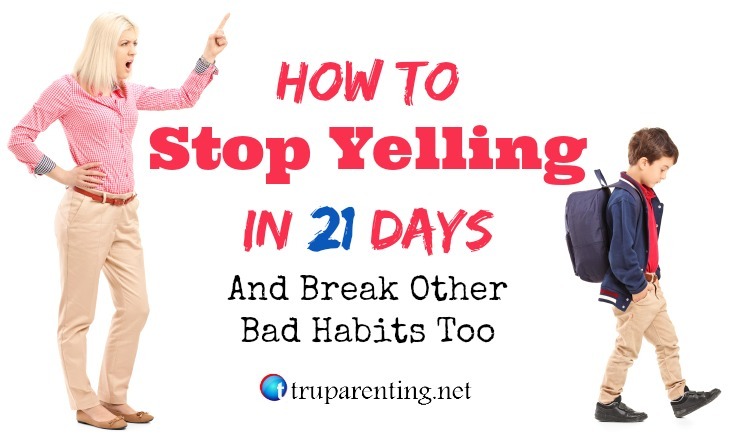 The 21 days procedure above can be a powerful step in the right direction and can help you take the edge off of the relationship enough to do some of the other internal work to not only stop the behavior of yelling but change the entire cycle of anger and yelling and replace it with cycles of healthy respect and communication. When I teach TRU Parenting, I suggest that parents give up control and trade it for influence, give up perfection for improvement and give up the right way for A GREAT way. Remember that the urge to yell was born out of something deeper inside you. There are reasons why those things that trigger you, set you off. There are reasons that it is hard for you to let go of the control, perfection and “right way” of dealing with those triggers. Remember that your child has his own perspective and the more that you grow to understand and work with instead of against that perspective, the more effective you will be in teaching and building lasting supportive relationships. All of these things grow out of your desire and application to first upgrade yourself. 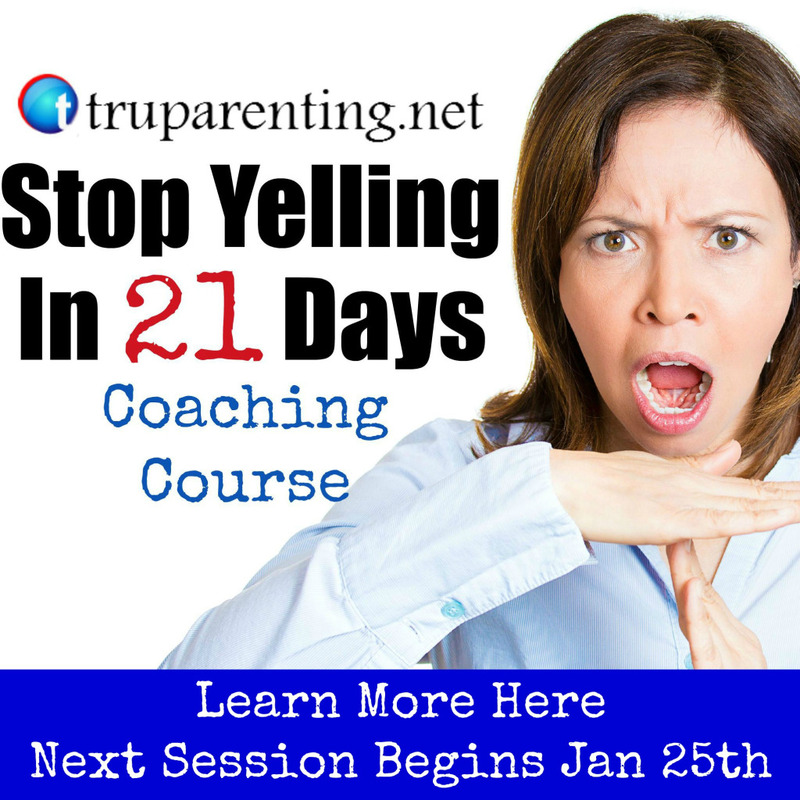 If you enjoyed this post and could use a little extra help to make this charge to stop yelling a reality, Sign up for our Stop Yelling in 21 Days Coaching Course that starts Jan.25th, 2016! Learn more by clicking the image below. Enhance your ability to stop yelling with the “Quick Calm Toolkit!” In the Quick Calm Toolkit you’ll get worksheets to track and magnify your efforts and commitment to stop yelling as well as receive a short audio recording of a quick technique that will help your decrease your stress, anxiety and frustration in literally 2 minutes to make the challenge to stop yelling much less of a challenge! 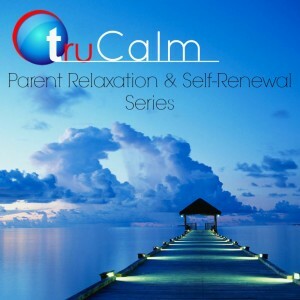 To get TRU parenting updates and the amazing Quick Calm Toolkit, enter your email below! If you really want to step up your parenting game and and support a calmer, more mindful approach to parenting you can try the TRU Calm Parent Relaxation and Self-Renewal Series. You can purchase it now by clicking below! Perfect! Thank you Andy. I’ve shared this in my Stop Yelling Group and the members have found it quite useful. Thank you so much Amanda! It really is a helpful technique to use. I hope it helps them as much as I’ve seen it help others. Going to be implementing this at home and sharing it with therapy participants. Thank you. Thank you Maureen. Please let me know how it goes for you. I hope this works I yell so much it makes me sick. If I don’t yell they don’t listen and it’s giving me health issues now. Thank you so much I have my fingers crossed. Thank you for sharing your experience Stacy. It’s always helpful to know that we are not alone. I wish you both the best in this experience and hope that I can help in any way I can. The biggest reason people start yelling or getting aggressive is because they fail at follow through, and their initial threats (grounded, no toys, bed with no dinner, whatever the punishment is) go unheeded because the kid knows you will not follow through. But this is also important with good things. If you tell your kid you will go do something they want to do and then neglect to do so, it will tell them your promises are empty. If your promises and threats are empty, they will cease to listen to you. This, in turn, will make it so you find yourself at wits end, screeching. It’s been a month since you posted, not sure if you’ve done the 21 day challenge, but if it didn’t work some how just remember to follow through next time. If your child does something you have told him you do not approve of, remind him that there is a consequence to that action. If he continues, punish him. Do not dally, do not wait until he does it a third time. Once you’ve promised this punishment and made good on it initially, stick to it until it is over. If the punishment is standing in the corner completely silent for 5 minutes, you keep resetting that clock if he’s throwing a tantrum. Once he is standing there, silently, set your timer for 5 minutes. You are the parent, you need to have more patience than him. Outlast him. I know it is not convenient, but it’s required if you want your sanity. I still don’t respect my mother’s attempts at authority (despite nearing 30) because she never followed through, promise or threat, and she never corrected the behavior. Do it before the kids turn about 10. At that point they’ll fight you far, far more, and changing the behaviors will be extremely difficult. I have always followed through but my boys only listen when I raise my voice & yell..which is by far very exhausting doing it every day…I hate yelling and want to stop but fail almost every time. Love-your-suit, I have to completely disagree and declare to all the others that have commented and are reading this article that I do not in any way endorse what you are suggesting above. I contemplated taking your comment down due to the use of vulgar language and how much I disagree, but decided to reply instead because I do think that people have the right to share their opinions here. Your procedure of punishment that you outline above is a never ending negative cycle. It MAY eventually get a child to be compliant (maybe), but it will not teach them what they need to learn. Different problems have different solutions. I appreciate you sharing your thoughts. There is one thought that I agree with and it is that it is important to follow through with what we say, but not just constantly upping the punishment. TRU discipline is about teaching, not compliance and punishment. Kids respond when we teach them. Please read the article at the following link. http://truparenting.net/solution-punishment/ . If anyone has specific questions about dealing with specific issues please feel free to email me and ask, connect on facebook or continue to read through TRU Parenting’s articles. Please don’t go down the road of punishment outlined in the comments above by Love-your-suit. Thanks for your reply to the comments above Andy, parenting is not about training children using punishment (I’m grateful to know that it doesn’t work anyways) it is about guiding them through life with love and respect. Completely agree Jessica. thank you for your insight. Follow through with positive promises. Yes! Don’t make threats. Get rid of all the punishment garbage. There are such better ways. I would love to help you find better ways. thx for the info, i have a 3 yr and a 6 month baby. since i got the baby the girl changed completely like i have a new kid. I give her attention and all the love of the world but she still do the contrary. I yell at her like crazy at times, and i feel so bad, i be like wa the hell she’s 3. i give her the thinking chair punishment she never stays on it, i take her tablet, no treat punishment and she seems to go wilder. I really don’t know what to do. (I still live with my mum, and when i yell at her she goes to her and I know it is not good, but believe me I am tired arguing on the same stuff. Hopefully i be moving till the end of this year.) Thanks i needed this. My husband and I have turned to yelling. We know that it doesn’t do any good. We’ve seen it make things worse. But now we struggle to break this habit. This article and challenge appears at the right time for my family. I am not sure where to sign up though? Thank you for the tools Andy, this is exactly what we lack the most as adults, tools to deal with our own emotions, reason why we experience frequent emotional meltdown just like a little child does. Our own meltdown tell us how being punished in childhood (because most of us were) didn’t teach us anything but fear and of course it gave us no tools to life our lives. Hugs!! Thank you Jessica. I’m excited that I’m going o be offering a more comprehensive coaching course soon to give more practical skills, tool as well as inspiration and support to actually stop yelling and be calmer and happier at home. I hope this will be helpful to everyone that is trying so hard to deal with their emotions, like you said. Thanks for the kind words.